Conference is way more than listening to a motivational speaker. It can be a retreat that is a wonderful way for us to step out of our daily routine and focus exclusively on our relationship with Jesus. As Catholics, it is important for us to deepen our relationship and subsequent commitment to Christ in an ongoing way. There is great value in taking time apart from daily routine in order to spend time with the Lord. It can be most beneficial and enjoyable to experience a retreat in the company of others with the same desire, and under the direction of a knowledgeable guide. A time-tested way of growing in our relationship with Christ is by gaining an understanding of the way God guides us in everyday life. One of the great gifts given to the Church is how we come to understand this guidance through the rules for discernment, which St. Ignatius gives to us in his Spiritual Exercises. This will be the content of the two-day retreat presented by Father Gallagher, OMV at the annual Witnesses for Christ Conference in August. We have a rare and unique opportunity to be led by such a master retreat leader. Father Gallagher is a member of the Oblates of the Virgin Mary, a religious community dedicated to retreats and spiritual formation according to the Spiritual Exercises of St. Ignatius. He has dedicated many years to an extensive international ministry of retreats, spiritual direction and teaching about the spiritual life. Father Gallagher’s warmth and style of speaking is for people of all states in life and all levels of formation. The retreat will begin to build a foundation upon which we can better understand how God speaks to our heart. This will not be highly “intellectual” or impractical, or a spirituality meant for the experienced scholar or advanced prayer, or even for a person with a religious vocation. What we will learn is a spiritual language that, in fact, we already know, but don’t have the words to express – one which, once we become acquainted with it, will equip us to identify, understand and grow our relationship with the Lord. Priests are trained by outstanding presenters, which allow them to bring the message to everyone to whom they minister. But now we can receive this excellent teaching firsthand. Every year in August, the Witnesses for Christ Conference features some of the best speakers in the country; and this year, the two-day conference will be formatted a little differently. 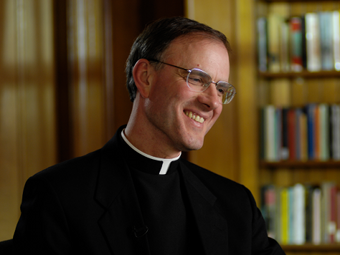 This year, all attendees will have the opportunity to be led by Father Gallagher, who is a retreat master, as well as a world renowned scholar and talented teacher. Father Gallagher is usually booked at least three years out, so this is an excellent opportunity for any Catholic in the diocese. At the annual Witnesses for Christ Conference, in addition to the Retreat, there will also be a time for informational sessions on various aspects of parish life. A brochure for the August retreat is being developed and will be distributed soon. You won’t want to miss this amazing opportunity to gather with hundreds of people from around the diocese who have a common goal of growing in their relationship with Jesus Christ. Plan to attend and bring at least two people from your parish with you! by Ann Lankford is Director of the Office for Catechesis and Evangelization. The retreat will be Aug. 26-27 and will be held in La Crosse. This conference will be hosted by the Offices for Catechesis and Evangelization and Youth and Young Adult Ministry. If you would like additional information or the brochure to register, please contact Ann Lankford at alankford@diolc.org or Chris Rogers at crogers@diolc.org.